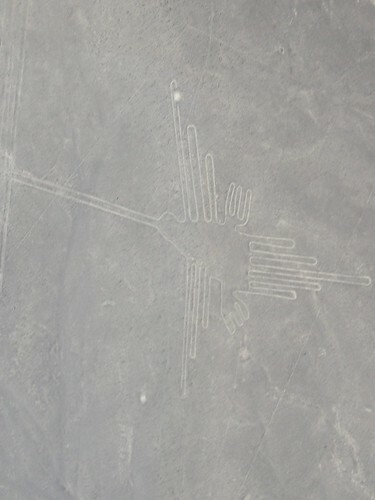 Now, I've always been pretty fascinated by the nasca lines. 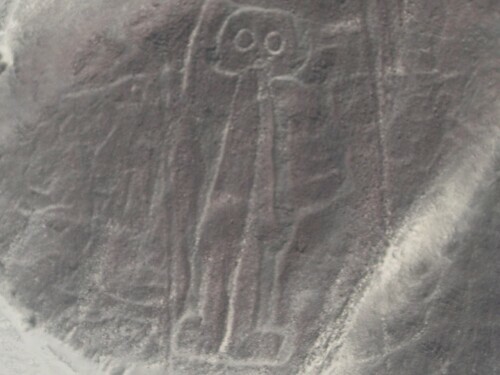 If you don't know, they're these massive images carved into the landscape by the pre-Incan Nasca people. 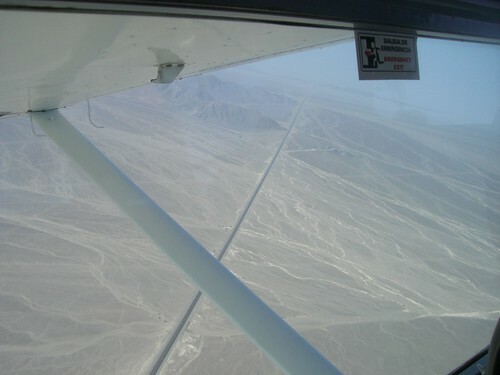 Its not possible to make them out from the ground (except to see white lines everywhere) but back in the 1920s, some commerical airline was flying over the site and spotted the lines. Amazing. Turns out these lines have no real explanation, except that some of them map to star constellations, some point to the path of the winter soltice's setting sun (we missed it by one day) and some just look pretty cool. 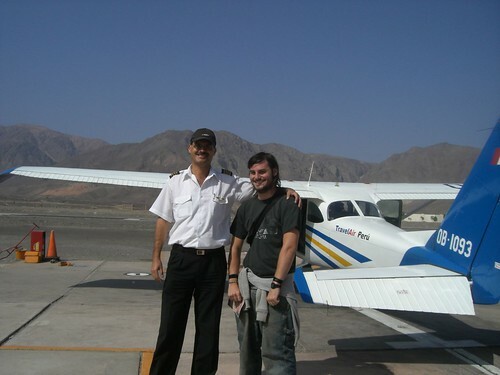 We took a 2 hour bus rammed with people to Nasca and after a horrendous night's sleep, jumped on a LIGHT AIRCRAFT for 4 people and flew over the lines. The photos are pretty rubbish (click on them for a better view) but the lines were wicked. Hundreds of them, scattered over the massive flat plane. 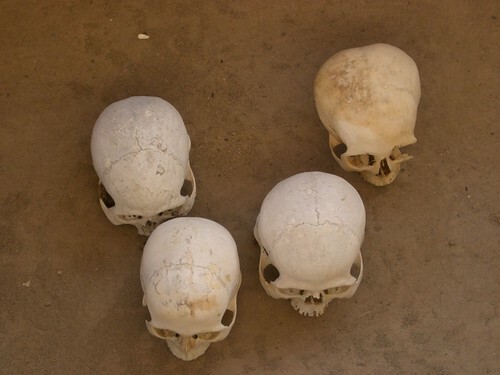 Loads washed away by the occasional river which flows over one of the driest non-desert landscapes on earth. Sam (again) was shitting herself, and suzi was about to throw up. But I was loving it. I'm cleary turning into an adrenaline junkie. 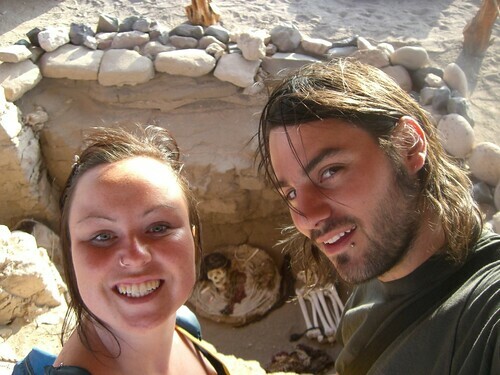 After the flight, suzi needed a break for adventure sports, so sam and I took off to this awesome cemetary where they collected hundred of wrapped mummies and bones and put them in tombs to display the ancient burial methods that the Nasca people used. We had a peruvian guide, who only spoke spanish, and I managed to translate pretty much everything for sam, so at least my spanish improved. After what was a horrendously expensive day already, we booked onto a 16 hour night bus to Cusco. THAT'S gonna be hideous.